When we think of cowboys we think of vast western lands, and of course the Wild West, the frontier, Indians. The butteri reside in the Maremma region, a coastal area of western central Italy bordering the Tyrrhenian Sea. It was adapted and tamed in the past as a place where men could cultivate with animals and live in harmony with them (It was a malarial region, but that was ended by the Second World War.) It includes much of southwestern Tuscany and part of northern Lazio. It is a civilized region, and a beautiful one, to which Walter Bencini's camera does full justice. 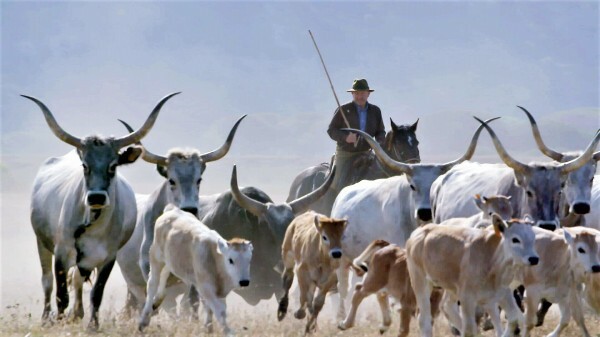 The men we meet are civilized and dedicated, responsible raisers of cattle who, we learn early on, make a point of knowing the names of all the cattle and knowing the names of their mothers and grandmothers, and can recognize them by the contours of their horns, or their stride. Ever see that talked about in a Western? The young ones still hanker after it. The special, closed world. When the older ones say "Si ruba cogli occhi," you steal with the eyes, they refer to the fact that the oldtimers would never answer questions, you just had to observe them. An oldtimer provides background, how the region was developed under fascism, how most of the butteri then came from the Veneto region. This is an exclusive, macho world, whose toughness and pride are reinforced by making it hard to enter. An oldtimer scoffs at the idea of accepting a woman, because he thinks the work of today's butteri has become too physically demanding.